Fly Predators from Spalding Labs. $0.00. Have to tell you after using Fly Predators for a year I am amazed at their effectiveness. We are in Eastern Oregon -- it is Fly Country USA. I have to admit I was hesitant at first but they are truly as advertised. I have been using the Spalding-Labs "Fly Predators" at my kennel since 2006. This was one of those products that I had to try before I could recommend it. I have never had a major fly problem but I really can't stand them. Despite using traps and sprays to keep their numbers down, keeping my dog areas clean, and cutting the grass short, I always still had flies. Since starting the Fly Predators, I have eliminated almost all of them. It is rare to see a fly at the kennel. I can even tell the difference between the kennel and the house (where I don't use them). We only have a couple of dogs up at the house and flies have never been an issue there, but I can see a noticeable difference between the number of flies at the house and the kennel. Using Fly predators is a safe, environmentally friendly, easy and economical way to control flies in your yard or kennel. Folks with 1 to 10 dogs are looking at about $20 a month for the next 6 or 7 months. When you order Fly Predators from our friends at Spalding Labs, you will be able to choose between monthly payments or paying for the entire season upfront. Spalding Labs will charge your credit card and send your Fly Predators directly to you. Because of this, Fly Predators will not count toward Free Shipping on items ordered from Gun Dog Supply. If you have any questions or issues with your Fly Predators order, just let us know. Fly Predators from Spalding Labs -- Virtually Eliminate Flies from Your Kennel or Farm Without Pesticides! Your Fly Predators order will be handled and processed by our friends at Spalding Labs. They will then ship your Fly Predators directly to you. Typically you need 300 Fly Predators per dog every three to four weeks during warm months. With a cost ranging from $4.39 to about $2.68 per thousand, depending on shipment quantity with a minimum of 5,000, the cost per animal is minimal while the resulting benefits are substantial. 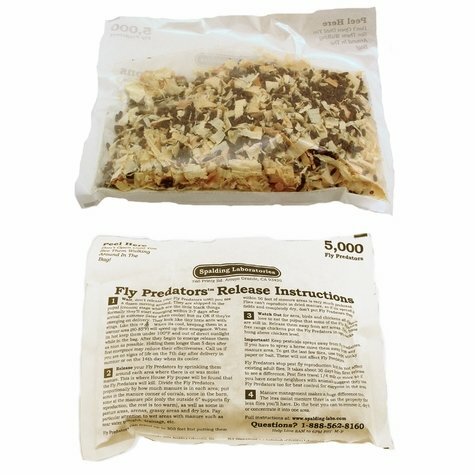 Often times, Fly Predators will actually cost less than your past fly control efforts! Fly Predators are the original method of fly control. They are nature's enemy of all common manure and rotting organic matter breeding pest flies, including the common house fly, horn fly, biting stable fly, and lesser house fly. In the natural environment, Fly Predators help control pest fly populations by destroying the next generation of flies in their immature pupa (cocoon) stage. Most locations normally have some of the species in Fly Predators already, but unless supplemented regularly, they cannot provide the nearly total fly suppression people prefer. Fly Predators are tiny, completely biteless, and stingless. They never become a pest themselves. After they've emerged, their only goal is to reproduce by finding pest fly pupa. Because of their small size and the fact they live their entire life cycle on or near manure (where the pest fly pupae is typically found), Fly Predators go virtually unnoticed. I am interested in the fly predators to control flies around my 2 dog kennel but am concerned as to what they will do to orchard bees or the honey bee pupa. Do you know if any bee keepers have reviewed this procedure or have any concerns? The Fly Predators are very host specific and only attack the pupal stage of several species of Diptera (flies) which are primarily referred to as the filth flies including but not limited to the following: House Fly (Musca domestica); Stable Fly (Stomoxys calcitrans); Horn Fly (Haematobia irritans); et al. Honey Bees belong to the hymenoptera family (bees and wasp) which are in the same family as the parasitic wasp and are not attacked by Fly Predators.